I’ve been editing Sanguine and I only have a handful of chapters left to red ink, and then I can make the changes on the computer. I think I want to give it one more round of polish after that, and maybe see if I can get a volunteer to give it a read through and provide feedback. I found a great location for editing – the common room of the local branch of a university. There’s not much of anything going on right now so it’s practically deserted and I can sit down and work without the distraction of rats and the internet. It is slightly annoying because I have to leave myself notes to look something up later, but on the other hand, it’s more productive because I have to leave myself notes to look something up later. And speaking of productive, I haven’t been very. But I just signed up for a page a day challenge on Face Book, so I should get 30 pages added to Book One of The Other Mages trilogy before July Camp starts. Maybe even more if I really get on a roll with it. And one page a day isn’t an overwhelming amount, so hopefully the “one page at a time” approach will get me through the initiation scene that I’m avoiding. It will be much smoother sailing once it’s over and done with. Last night I thought I had a piece of tape stuck to the bottom of my foot, so I tried to pull it off. It turned out to be a piece of skin — apparently my feet are cracking and peeling — and now I have to wear a bandaid on my foot because I now have a hole in the bottom of my foot and it hurts without the added cushioning. Editing is a lot like that. See, I was fussing at the “tape” on my foot in the dark — I couldn’t see what I was doing, so I just kept fiddling with it and picking at it until I realized my mistake. By then it was too late — my foot hurt, the peeling was worse than before, and the skin was catching on the sheets. If I had bothered to shine a little light on the subject, (and if I had been able to see the edge of the bottom of my foot), then I would have stopped before it got to the point of pain and repair work. Sometimes in editing, there is a failure to shine a light and look at what you’re really doing. You fuss and fuss at small things and cut them out without looking at the overall picture. And by the time you realize what you’re doing, the damage is done and you have to start patching plot holes that didn’t used to be there. Introducing some other characters – and a few bits of Gregor’s past. Kaen and Gregor are still on the station, making their way back to the ship when they run into an old friend of Gregor’s. Kaen unnerved her so Gregor stepped away to talk to her for a moment. Kaen studied her for a moment, curious about this friend of Gregor’s. She was maybe five feet tall and he doubted that she weighed ninety pounds fully clothed and soaking wet. Wide grey-blue eyes regarded him from a creamy olive face. “In what capacity?” he asked. Her eyes widened. “You mean it? Just like that?” She looked from one to the other as if expecting it to be some sort of joke. Check out Sunday Snippets for great stuff from other writers. What have I been doing on my days off? Sadly, I just can’t seem to be satisfied with this book, and I have the feeling that it’s going to go through at least one more round of tweaking before it’s ready to be loosed on the world. So Id say that I’ve sort of been in a writing void… except it’s getting really crowded in here and I’m being pulled in several different directions. So maybe “vortex” is a better word. Unfortunately, however, this leads to the question of where to put the cage that they are currently in, as I want to put the new one where it is. I don’t want to tear it down as I’d like to keep it as a holding cage for cage cleaning days. Currently I’m using a bird cage that I converted into a rat cage. Move the bird cage (possibly disassemble it), put the current cage where it is now, and put the bigger cage where the current one is. If I move this scene to later in the book then I have to change all references to what happened in it. If I take this scene out then how is Character A going to find out about Character B? Moving this scene to later in the book screws up Character C learning about what happened. The characters already know about XYZ because they were there when QRST happened. For every change you make there are ripples of other changes that have to follow, and consideration must be given to how and where you are going to put things. And The Academy of the Accord series is full of situations like the ones above, especially considering that it is a 12 book series and changes in one book’s draft causes changes in another book — sometimes in multiple other books. Ah, well, both the cages and the plots will get worked out eventually — somehow. I have time for both, especially as my other plans for my days off (switching seasonal clothing) has been put on hold due to unseasonable weather. Skipping ahead a bit to start introducing some other characters – and a few bits of Gregor’s past. In this post, Kaen and Gregor have gone to clean out Gregor’s quarters on the station. Kaen has been looking through a photo album while Gregor packs. Picking up from last week’s snippet. Kaen wrapped his arms around him and pulled him against him, holding him tightly. “Thank you for that,” he whispered. to go with the following w(h)ine. It’s been one of those weeks. Nothing too major, just a whole lot of little things that added up a big time and energy loss and ended up in a “why do I bother?” sort of mood. Why do I keep writing? Does anyone care? Would anyone miss me if I quit? It’s a bit of a crisis of faith, isn’t it? If you create stories that no one reads or cares about, why bother? Why not just give up and keep your stories to yourself, or even avoid the work of typing and just keep them in your head? It’s just not that simple, is it? We write — well, I write — for a variety of reasons. I write because I enjoy creating worlds. Back when I played D&D, that was my favorite part of being a DM — creating the dungeon and the world. And even then my characters were pretty well developed — the important NPCs even had back stories. I write because I have stories to tell and characters to introduce, and I hope that someday one of those stories or characters will touch someone, that a story will strike a chord with them and they will feel less alone for having made friends with the characters whose story it is. It’s a faint hope, especially in “why bother?” weeks like I’ve had this week, but it is still there, so I keep on keeping on. That’s all the reason you need. So, I should be working on editing Sanguine, and on finishing The Other Mages trilogy. That’s what I should be doing. And I know better than to get caught by other plot bunnies and be sidetracked into starting something new: that way lies madness – and a whole lot of unfinished stories. Okay, well, maybe not in forever, but at least not since some time last year when I wrote another installment in The Academy of the Accord. So, yeah, I needed a break from the series – it was creating too many headaches – so I decided that this year, before going back to work on it, I would get Sanguine edited, formatted, and published, and would finish, edit and publish all three books of The Other Mages trilogy. 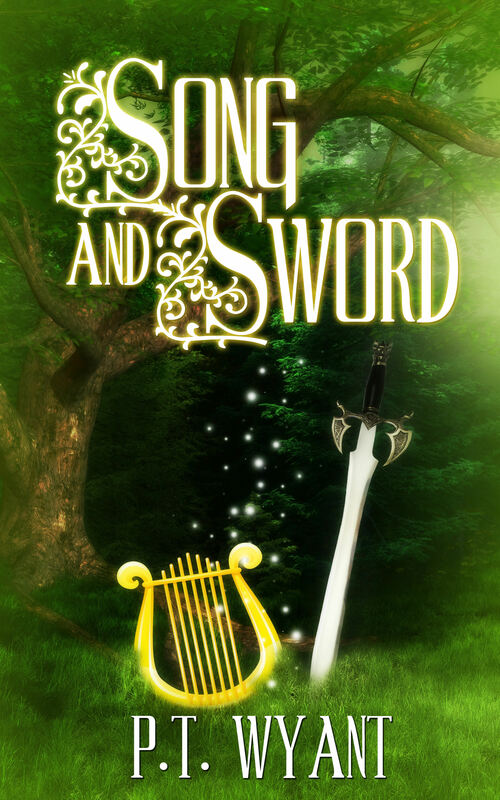 And the only “new” thing I was allowed to start was to be work on a sequel to Song and Sword for November’s NaNoWriMo. The point is… I now have the urge to write their story. Or at least certain scenes of it. But at the same time, I don’t want to fall back into the inescapable trap of the series that has no end. “What is her name?” Kaen asked softly. Again a stabbing pain lanced through Kaen’s temples. Once upon a time, a friend of mine (Robert Emmett) posted a thing on his wall on Facebook about a writer calling in sick. It was just a little blip that he had written and he posted it just to post it, not really expecting any response. At the time, I was writing some heavy emotional scenes, so I wrote a joking reply to it, just to save my sanity. And we started a back and forth exchange that he later posted to his blog. I always suspected that the answer wasn’t nearly as deep as my teachers tried to make it. I’m now convinced that I was right.